A brawl after a Walnut Creek firefighters’ ball will have lasting consequences for at least one of two East Bay emergency responders. 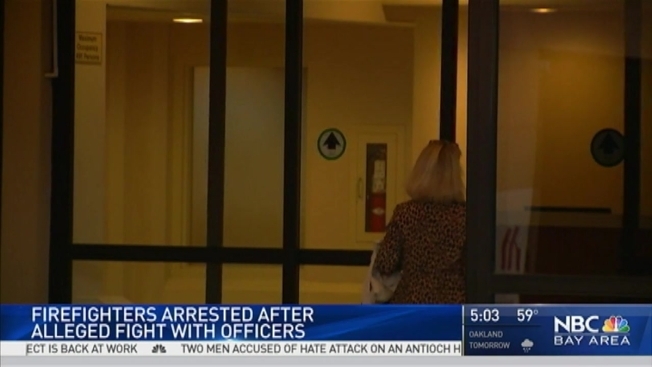 Lontavious Johnson and Andrew Desmond with the Contra Costa County Fire Protection District are accused of attacking police officers in a drunken scuffle, and being a safety threat to the public they usually protect. "This is extremely rare," admitted Aaron Doyle with the Contra Costa Emergency Medical Services Agency. "I've never ever seen [this] in my career." An emergency hearing Thursday came a day after the pair was criminally charged with battery and assault. An officer testified that Desmond said, "There [isn't] going to be any talking. It [is] time to fight." Johnson has agreed to settle his case. His attorney told NBC Bay Area that the terms of his settlement are confidential. Meanwhile, Desmond's attorney James Bustamante said his client has "taken responsibility for it and feels very bad about it and wants to move forward." Both Johnson and Desmond have been on paid administrative leave from the fire district since the Oct. 23 incident. He continued: "If my client loses his license, which is a requirement of the job, [then] he's going to lose his job and that's an unfortunate circumstance for one indiscretion." This saga began when two Walnut Creek police officers were injured after responding to a report of unruly guests at a Marriott Hotel, where the annual Firefighters Ball was held. Two Contra Costa firefighters — Johnson and Desmond — and their companions were arrested as a result, police said. The officers were called to the hotel early Sunday morning, just hours after the party ended. When confronted by police, the four guests, who were described as being intoxicated and belligerent, refused to leave or cooperate with officers, police said. When Desmond assumed a fighting stance, two officers tried to arrest him, and he proceeded to assault both of them, police said. Desmond, a Contra Costa Fire engineer, put one of the officers in a headlock and tossed him on the ground, starting a brawl, according to a hearing representative. Desmond, 31, is also accused of kicking a police officer and had to be Tased twice, police said. Both officers suffered minor injuries and were treated and released at John Muir Medical Center, police said. While in the hospital, Desmond admitted he drank too much and later told an investigator that he was remorseful for what he could remember doing. He was booked into county jail on charges of resisting arrest, assaulting a police officer, public intoxication and trespassing. Leah Mendaros, 35, assaulted hotel security personnel during the struggle and was placed under citizen arrest for battery, police said. She was booked on charges of battery, public intoxication, trespassing and obstructing an officer in the performance of their duties. Johnson, 32, and Shirlee Johnson, 33, were arrested for public intoxication, trespassing and obstructing an officer in the performance of their duties. Editor's note: A previous version of this story stated that Lantovious Johnson gave up his EMT certificate as part of his settlement. However, his attorney cannot confirm that information.